Startup Europe Summit, Berlin February 12th and 13th. Now the term Internet of things is said to have been first used by Kevin Ashton as the title of a presentation he was making it to Procter and Gamble, linking RFID to the Internet. But we can probably trace its origins even further: in 1966 Karl Steinbuch a German computer science pioneer said “In a few decades time, computers will be interwoven into almost every industrial product”. Since then the concept has come a long way and is gradually even being understood not only by industry but by society at large. There are many, many definitions for IoT, some of them quite technical and long-winded for a lay person like myself, but essentially the Internet of Things is essentially a new paradigm in which intelligent, connected objects gather data, analyse that data and then decide on a course of action. When you add the appendage “Services” of course, the field (and the market) opens up even further to include human intervention that fills a business opportunity predicted by the McKinsey Global Institute to reach 6 trillion USD (€5.3 trillion). In fact estimates vary widely and in 2014 IoT hit the Gartner Hype Cycle Peak of Inflated expectations, but in any case it is clear it is going to have a huge impact on business. And that is exactly what we explored: to what extent can IoT really transform the world of business and how can IoT startups can take advantage of this transformation. 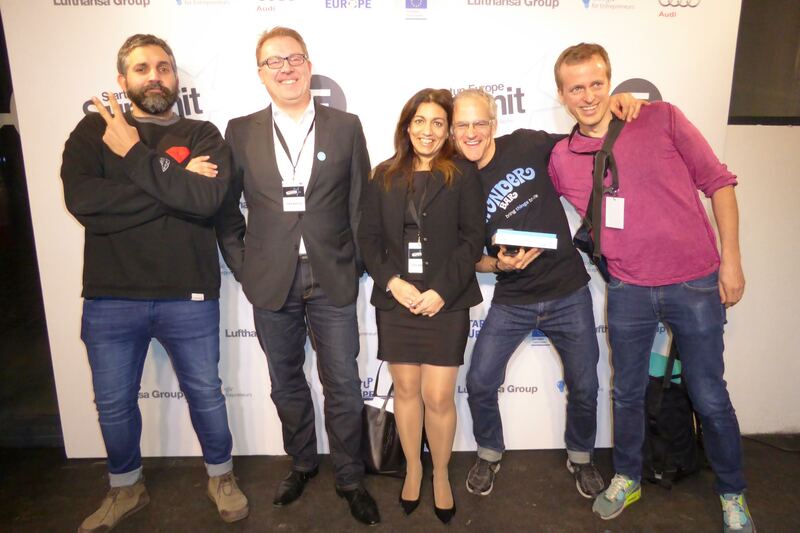 The panel was part of an amazing schedule organised by the Berlin Factory as part of the first Startup Europe Summit. Joining me were four panelists who are already exploiting the business potential of IoT: David Cuartielles, Co-founder and board member Arduino, a tool for making computers that can sense and control more of the physical world than your desktop computer. Hermann Salmen, the Strategy and Business Development Executive for Wincor Nixdorf International responsible for heading strategic innovation projects that include mobile money; Christian Bogatu, Co-founder and Managing Director of Kiwi.ki, a Wireless Technology held Keychain that, put simply, opens doors without without looking, without buttons, without a key (and I would add without breaking the law); Jackson Bond, from Relayr, which aims to accelerate your business into the Internet of Things with easy tools connecting things that include WunderBar. 1. THE LEGO APPROACH. Offering an IoT technology-based product of service is, from a technical viewpoint, much easier than you might think with companies like Arduino and Relayr offering the basic building blocks. 2. The AARGH factor. Actually it’s AAG (Amazon, Apple, Google) but anyway. Our IoT technology providers are continuously investing in developing tools that enable anyone with an IoT idea to build a prototype. But along with many other businesses, they live under a permanent threat that one of the major technology players will disrupt their future by just providing free IoT components. 3. THE GREAT DIVIDE. Having said this, IoT is an area in which established companies can particularly benefit from talking to start-ups and explore exactly how interconnected devices can add value to existing products, services and business processes. The main challenge, as anyone who has ever been in a business development role can tell you, is to pinpoint the right person in MegaCorp Inc who will help you to get the ball rolling. 4. TIPPING, TIPPING, TIPPED…Our panellists would not be drawn into predicting the tipping point for IoT but agreed that use cases were critical for wide-spread adoption. It would appear that the proverbial fridge that stocks itself up cannot get us to jump into the IoT pool on its own. “to what extent can IoT really transform the world of business and how can IoT startups can take advantage of this transformation.” This is an interesting subject, considering that IoT is really part of the community hype right now. I do believe there is so much more things that are in store for IoT in the future.